A handout picture released by the Syrian presidency's press office shows Syrian President Bashar al-Assad during an interview with AFP in the capital Damascus, on April 12, 2017. Syrian President Bashar al-Assad is remaining defiant amid widespread accusations his government carried out a deadly chemical attack last week, as monitoring groups say his forces along with Russia have escalated attacks on civilians in a clear challenge to the international community. In his first interview since scores were killed in an April 4 chemical weapons airstrike on Khan Sheikhoun, Assad told the French news agency AFP the incident was a "fabrication" to justify a U.S. military strike. "Our impression is that the West, mainly the United States, is hand in glove with the terrorists. They fabricated the whole story in order to have a pretext for the attack, It wasn't an attack because of what happened in khan Sheikhoun. It's one event, its stage one is the play that we saw on the social networking and on TVs, and the propaganda, and the stage two is the military attack," he said, adding that his country's forces handed over all of its chemical weapons in 2013. Assad said the "firepower" of his forces has not been diminished by the April 7 U.S. Cruise missile strike on al Shayrat, the airbase from where Washington says Syrian jets took off from to carry out a sarin gas attack. In the week since the attack on Khan Sheikhoun, the Syrian Network for Human Rights says there has been a rise in the use cluster munitions, incendiary weapons and barrel bombs by the regime, resulting in the deaths of at last 98 civilians, including 24 children. It also claims in a report released late Tuesday that toxic-gas grenades were launched by government forces in the Damascus suburb of al Qaboun. There has been on independent confirmation of that report. The monitoring group, whose reports are used by the United Nations, describes some of the regime’s military operations as deliberately targeting residential areas and facilities, including mosques, rather than just being indiscriminate. It judges that the attacks are partly in retaliation for the April 7 U.S. Cruise missile strike on al Shayrat, the airbase from where Washington says Syrian jets took off from to carry out a Sarin Gas attack on Khan Sheikhoun. That attack left more than 90 civilians dead and hundreds injured, according to activists and first responders. “The Syrian regime will continue to challenge the international community, testing its limits the same way the regime gradually elevated its use of weapons until we reached chemical weapons,” warns Fadel Abdul Ghany, SNHR chairman. Four mosques, three schools, four medical facilities and a market were struck by Syrian or Russian warplanes and helicopters from April 4 to April 11, says SNHR. Five attacks saw cluster bombs dropped and half-a-dozen were carried out using incendiary weapons. According to the monitoring group, Syrian government helicopters dropped 125 barrel bombs in Daraa, 23 in Hama, four in Idlib and five apiece in Aleppo and Homs between April 7 to April 11. FILE - White House press secretary Sean Spicer speaks during the daily briefing at the White House in Washington. 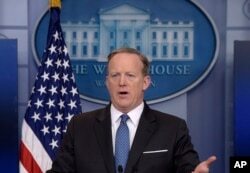 On Monday, White House spokesman Sean Spicer told reporters in Washington that the Syrian government's use of barrel bombs could prompt further U.S. military intervention. “If you gas a baby, if you put a barrel bomb into innocent people, I think you will see a response from this president," Spicer said at the White House during a daily press briefing. FILE - This photo provided by the Syrian anti-government activist group Aleppo Media Center (AMC), shows a Syrian man carrying a girl away from the rubble of a destroyed building after barrel bombs were dropped on the Bab al-Nairab neighborhood in Aleppo,Syria. Barrel bombs, cheaply-made improvised containers packed with explosive and metal fragments, have been dropped frequently by Syrian government forces during the course of the six-year-long conflict. This VOA correspondent witnessed the use of barrel-bombs during several trips inside northern Syria in 2013 and 2014. Last year alone nearly 13,000 barrel bombs were dropped from government helicopters, according to monitors and rights groups. In an interview with the BBC in 2015, Assad denied his forces ever dropped barrel bombs. “I know about the army. They use bullets, missiles and bombs. I haven't heard of the army using barrels, or maybe, cooking pots," he said. One of the biggest incendiary-bomb attacks came Sunday night with Russian strikes on the rebel-held towns of Latamneh and Saraqeb near Khan Sheikhoun. Video footage purportedly of the attacks were posted by activists online and showed enormous fireballs. 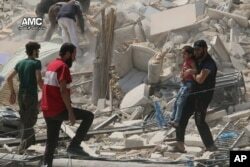 Another watchdog, the Syrian Observatory for Human Rights, which is based in London but oversees a network of activists on the ground in Syria to gather information, also reported Thursday a surge in Syrian government and Russian military activity with more than 120 airstrikes in the northern countryside of Hama in the past 24 hours. The Observatory claimed government helicopters dropped barrel bombs overnight on the towns of Tayyibat al-Imam and Soran, both off which were targeted in heavy artillery shelling Thursday by regime forces.